J. Scott Wilson at WPBG-TV, the ABC affiliate in West Palm Beach, Florida has written an article about and review of the various fast food biscuits. 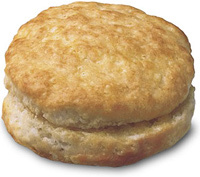 As Wilson says in his article, "In the South, making good biscuits is almost a religion." Which means fast food biscuits have a lot to live up to in the South in order to draw customers to their breakfast menu. Wilson rated the fast food biscuits as follows (from best to worst): Chick-fil-a (A+), Hardee's (A-), Burger King (C+), McDonald's (C), and Jack in the Box (D). Of Chick-fil-a's biscuit (pictured above) he wrote that they are "light, fluffy, lightly buttery marvels that taste like they're produced by an army of highly experienced grandmothers living somewhere in the back of the restaurant. The crust is perfect, lightly brown and slightly crispy, and the middle simply melts in your mouth." read it all: What Chain's Biscuits Beat Grandma's? For what it's worth, I love biscuits, I like them more than English muffins, but I continue to order an Egg McMuffin at McDonald's solely because McDonald's biscuit just doesn't cut it. I'm glad someone else agrees.